Listen in on a conversation with my good friend and colleague Stacie Speaker. Learn more about me, my journey, and my life philosophy and walk away with insights, tips, and questions to help you reignite your joy! 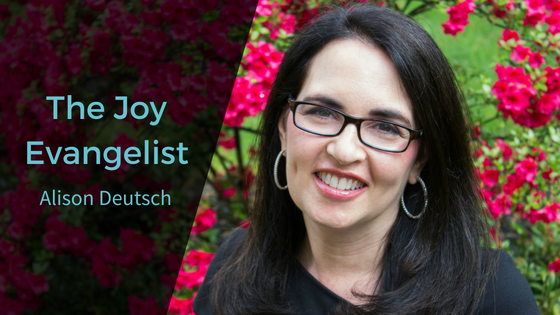 I’ve struggled with the idea of calling myself a “Joy Evangelist” - people can find it be off-putting. Really, who wants to be around someone who is happy all the time, always telling you to look on the bright side, and never seems to experience negative emotions. No, I’m not a Pollyanna. JOY is the spark we need to get unstuck and start making changes in our lives. This can be the spark to get moving again and empower us to write our own future. Joy is the fuel for success rather than where I got it all wrong thinking that first you have to be successful and eventually you will be happy. The: I’ll be happy when syndrome. We all have joy within us, the only question is how do we access it. No, I’m not happy all the time, that’s not my truth. The only people who don’t experience negative emotions are either psychopaths or dead. The idea is to really feel all our emotions, to give ourselves permission to be human, rather than trying to numb the negative. As Brené Brown’s research shows, you can’t selectively numb - when you numb negative emotions you don’t feel positive ones either. Feeling uncomfortable emotions like anger, fear and frustrations can be the impetus to take action and move forward. The key is do not get stuck in our story, if you keep telling yourself the same storyline it’s hard to make the shift. I’ve seen how we can use joy and other positive emotions to get moving again and create the change we want to see in our lives. While we can’t change the past, we have the power to change the ending. We can write our own future.